Are you in shape except for this stubborn belly fat? Have you tried everything from crunches to cardio to make it disappear and it hasn’t worked? What if I tell you that it takes a lot more to make that to make your midsection bulge history. It has to do with the foods you eat, your daily lifestyle, genes, and even the hormones in your body. Why do our bodies store fat there? Understanding why you have your belly fat is the first step to beating it. Simply put the fat around your stomach is your body’s way of saving for a rainy day. The food is saved there for emergencies, when food is scarce. That’s why it’s usually the last to go when losing weight. On a normal day, our bodies will use up the energy needed for the day and store the rest of it in fat cells. The extra layers build up when the body has more energy than it needs. Why is fat located around the belly and why is it hard to get rid of? A large factor to belly fat is our genes. If you take a look at your family, chances are you may develop a similar body type. You need to embrace your body shape and find the right clothes to suit it. However, there are a few techniques to try to keep it under control. Another reason it’s hard to lose stomach fat are hormones. When women get older and go through menopause, estrogen levels begin to decrease, which alters where the fat is being stored. Unfortunately, this makes women more prone to gaining weight around their bellies than men. It’s important to talk discuss weight gain with your doctor when experiencing it during menopause. Another hormone that can contribute to belly fat is Cortisol, the stress hormone. The stresses of life, like kids, bills, or work can result in more flab around the belly. That’s why relaxation is more important than you would think. Not only do you need it to clear your brain, but it also helps keep your belly trimmer. Like it’s not enough to just worry about not fitting into your favorite pair of jeans or that swim suit season is just around the corner. There are also a lot of health issues to make it better. When the fat surrounding organs is excessive it can be linked to type 2 diabetes and heart disease. New research has shown it can also lead to a reduction of bone mineral density and adds fat to bone marrow. There are ways to improve it.. Doing what you’ve been doing in the past might not be the key. You’ve got to change it up, from your exercise routine to your eating habits. Forget your work outs before and try to change it up. If you are used to doing crunches and sit ups, trying plank pose instead. Yoga is a great exercise to keep you feeling young and energized. It is really important to strengthen your core. So make sure when you work out to hold your stomach tightly. It gets much easier and you begin to remember to do it more with practice. Also, I recommend taking the stairs instead of the elevator for any place 6 floors or less. It really helps cut down belly fat!! This goes without saying. Decrease the fat in your daily diet if you want to lose weight. Also, it’s a great idea to eat 5 or 6 small meals or snacks a day instead of 2 or 3 big meals. This will help your metabolism keep going strong all day. It’s actually more about what you put in your body and less about how much you eat. Foods that are packaged are usually packed with hydrogenated oils and enriched flours and these will have you packing on the fat. Just stay away from it! The transfats found in butter, packaged treats, and pastas actually redistribute the fat, aiming it straight to your belly. Give up fizzy drinks, even the diet ones are bad for you and don’t add sugar to your hot drinks (a great replacement for sugar is honey). Try to avoid fatty food too, if you want a burger make it at home! 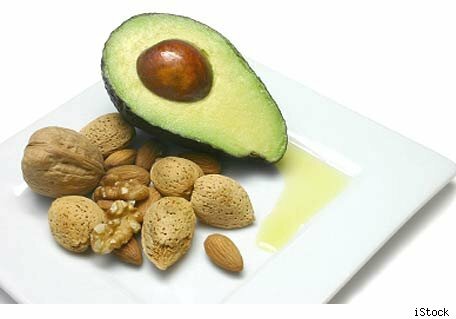 Stick to foods that contain monounsaturated fats, such as olive oil, nuts, and seeds. Other great fat burners are green tea, whole grains, and avocados. Add lean protein to a few of your meals to help develop lean muscle. It’s important to keep your fridge and pantries packed with these healthy sources of energy. Don’t go by what the scale says. Go by how you feel and how your pants fit. It’s a good idea to invest in a tape measure so you can measure your body and keep track of actual results. If anybody wants to take this challenge and lose their belly fat. Take a picture before and after and try all these tips for 6 weeks and send it to me, I have a free gift basket from Magic Herb. If you need help keeping your appetite and cravings under control, I recommend you try the Mega Thin Formula. It is an all natural supplement that suppresses your appetite, gives you energy, decreases cravings, enhances mood, and increases your metabolism so you can get better results and feel great! Reblogged this on Edward William James. Really good article. Thanks so much for struggling. I am definitely going to use the information provided since I am struggling with belly fat! Plan a healthy shopping list a week in advance. Shopping for one week is always a good plan, as it allows you to budget and learn from your mistakes. You will soon learn how much food is ideal and how much you will need to spend.